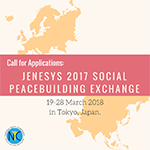 The National Youth Commission in partnership with Japan International Cooperation Center and the Embassy of Japan in Manila opens the application to the JENESYS2017 Social Peace Building Exchange which will be held on 19-28 March 2018 in Tokyo, Japan. The program aims to create a mutual understanding and trust among the peoples of Japan and the Asia Pacific region and encourage an understanding and dissemination of Japan’s economy, society, history, diverse culture, politics, and diplomatic relations. NYC will be sending 8 youth delegates to the program. The organizer will shoulder the delegates’ international airfare (Manila-Tokyo-Manila), meals, accommodation, and local transportation in Japan. JENESYS, KIZUNA, and SSEAYP Alumni. Alumni of all Japanese Government-sponsored (Japan Embassy, Japan Foundation, JICA, etc) scholarship, conference or cultural exchange or training programs. Applicants who have been to Japan, whether as a student, tourist or an OFW, and stayed in Japan for three months or more. Previous NYC International Programs Beneficiaries who have not submitted or accomplished the required post-program documents or volunteer work. Deadline for submission is 11:59 PM / February 4, 2018. Please send all queries to nyc.jenesyspilipinas@gmail.com with subject heading “Query: JENESYS2017 Social Peacebuilding Exchange”.